Space shuttle Enterprise is seen after Hurricane Sandy at the Intrepid Sea, Air and Space Museum in New York on Oct. 30, 2012. Photos show the shuttle's protective shelter has collapsed and the orbiter has incurred some damage. Space shuttle Enterprise, NASA's original prototype orbiter, is sitting exposed and appears to have been partially damaged by Hurricane Sandy after the severe storm passed over New York City on Monday night (Oct. 29). On display on board the flight deck of the Intrepid Sea, Air & Space Museum, a converted aircraft carrier, since July, Enterprise had been protected from the elements inside a pressurized pavilion. Based on photos posted online, the inflatable structure appears to have first deflated and then torn by the winds of the now post-tropical storm cyclone. Photos show the 180-foot-long (55 meters) by 60-foot-high (18 meters) pavilion's fabric exterior now lies draped over Enterprise, though much of the shuttle's nose section and part of its payload bay is uncovered. The orbiter's vertical stabilizer, or tail, is protruding out the top, where it looks like part of the spacecraft may have been torn away. "We certainly wish our best to everyone affected by the storm. It was a very big storm that affected many people," NASA spokesman Mike Curie told collectSPACE.com. "We are aware that Enterprise appears to be uncovered on the deck of the Intrepid, but we're sure that our friends at the Intrepid Sea, Air and Space Museum will do their best to take care of Enterprise and get it back up to shipshape as soon as possible." Intrepid officials did not immediately respond to a request for comment. Enterprise was delivered to the Intrepid in June after being transferred from its previous home of eight years at the Smithsonian National Air and Space Museum's Steven F. Udvar-Hazy Center in northern Virginia. In its place, space shuttle Discoveryis now at the Udvar-Hazy Center, having arrived in April after NASA retired its orbiter fleet in 2011. Discovery was also in Sandy's path, and the Smithsonian remains closed due to the storm. However, no damage to that shuttle was reported, nor was any damage evident on webcam footage of the vehicle. Enterprise, built in the 1970s, never made it to space, but was used instead as a prototype to test the space shuttle design during approach-and-landing glide tests. 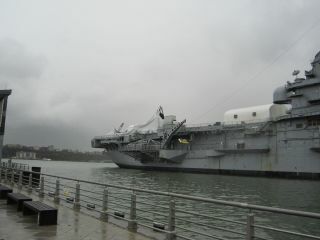 Since arriving at the Intrepid, Enterprise has been housed in its climate-controlled inflated pavilion. This shelter was never meant to be permanent, however. Ultimately, the Intrepid has said it plans to build a larger, separate facility to showcase the shuttle and enhance the museum's other space exhibits and educational displays. As of Tuesday afternoon, Sandy was centered about 50 miles (80 kilometers) east-northeast of Pittsburgh, moving westward and weakening over Pennsylvania, according to the National Hurricane Center (NHC) in Miami. The storm's maximum sustained winds were 45 mph (72 kph), down from 90 mph (150 kph) on Monday when it was a Category 1 hurricane. Follow collectSPACE on Facebookand Twitter @collectSPACEand editor Robert Pearlman @robertpearlman. Copyright 2012 collectSPACE.com. All rights reserved.